I'd like to nominate UNUKK. This custom plays differently than most other cards. It does not soak up all your order markers each round. It's a very reasonable hero for the point value, and it's value as a unit is not limited by it's left hand stats like other niche heros which strongly favor a specific species build ie; Nerak, Arkmer. The role it fills is tactical and is able to serve in many types of armies rather than just one particular race. Thats all I can really say about it right now, so I'll leave it to the judges, experts, and renown critics to work on this. Thank you for taking the time to look this over. DM7A, what sculpt is that? Looks like one of the Mage Knight orcs, but I'm not sure. Might even have it in my bin o' Mage Knight. But we can't really review a figure without knowing where 'Scapers might go to find the sculpt. If you don't know, that's cool. Maybe someone recognizes it & can chime in. But I won't vote until that aspect of the nomination is addressed one way or the other. 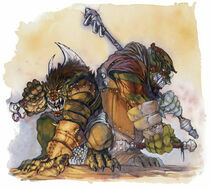 That's a Tanarukk, D&D Minis from Giants of Legend. The issue with Unukk is Savage Frenzy could potentially let you take unlimited turns if your opponent has all the same common squad. While it punishes your opponent for doing so there are problems with common squads and heroes as they all can use one card. Ahh, thanks robbdaman. I hope DM7A doesn't mind me asking this so bluntly, but is it as ugly as it looks? It looks like the group of smooth-skinned pea-green Mage Knight orcs; that's why I thought it might be one. Good point, sorry about that. The figure is a dnd mini from Giants of Legends set named Tanarukk. Seems to be available at a reasonable price. Auggies, Coolstuffinc, and here is a link to the official gallery for size comparison to other figures. You might recognise the wyrmling pictured next to him. Yeah it's an older paint job, for that line, not very pretty. You can read more about the Tanarukk. On the one hand, I'm comforted that most of the minis on that page are awesome. I hope some of them find their way to this thread eventually. On the other hand, Tanarukk has to be the worst one. I don't like the sculpt so I'm voting no to reviewing UNUKK. I *really* like the Savage Frenzy mechanic. I like it a lot. I'm not really interested in trying to open up a can of worms but I think something could be better explained in the first post. I recognize that asthetics have a place in this game and I can respect everyones choice on that matter. However, if asthetics are going to one of the criteria for accepting and rejecting customs to the SOV then perhaps it should be included in the OP. * Balance-Are the points correct? * Playability-Are the powers clear and understandable? Are its master stats appropriate? If it is Large or Huge, what type of base does it use? Is it visually distinct from pre-existing units? * Creativity-Does it add something new to the game? * Theme-Does it fit in the HS universe? I'm also a big fan of the mechanics of Unukk, but as I've mentioned before to Gamebear, I'm not a fan of the sculpt. He likes it, but acknowledged that that's probably a minority opinion. With a better paint job it can look pretty good. It was not our intention at the time nor is it my intention now to get lawyerly in here. I *can*, don't get me wrong, but there is no appeal process & there's my decision. That said, we did discuss game aesthetics issues behind closed doors early on (as I recall) & we were satisfied that we were covered. As I said early I respect your stance. I'm not asking for an appeal and have no intention of requesting one. I was quoting the OP to point out that it does not specifically state anything about aesthetics. Whatever the reasoning was discussed behind closed doors is not my business and of no interest to me. I'm just recommending that aesthetics be included in the judging criteria, it might help avoid similar discussions from cropping up in the future. Thank you for choosing that particular line to use so that I may further explain why I feel it is a poor choice. In terms of that particular criteria I think it's easier to ask what does not fit in the heroscape universe? These threads are riddled with praises of variety and the genre mix heroscape offers. I can see anything from Star Wars to Lord of the Rings minis fitting comfortably into the HS universe. So really asking if something fit in the HS universe is really little more than asking if it fits on the board. Do you see where this can lead to a bit of confusion? Last edited by Darkmage7a; December 29th, 2010 at 11:12 PM.